term lets on the Estate and within the village of Wing. 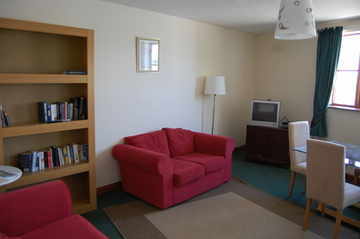 Each cottage or apartment is self-contained, equipped to a good basic level. All our holiday accommodation is equipped with dishwasher, oven and microwave. Towels and linen are included in the rental price. The Farm & Village Shop at Wing Hall is available for anything you might need during your stay. Our rates are adjusted to reflect peak, off- and mid-seasons. Prices start from £ 65.00 per-cottage per-night or £350.00 per week, and are priced per-unit to ensure value for money for families. Special rates are available on request for longer rentals. If you would like to make an accommodation request or inquiry, please complete the attached Holiday Accommodation Enquiry Form. The Old Butler's Office is a cosy apartment located on the main Estate and adjacent to Wing Hall itself. 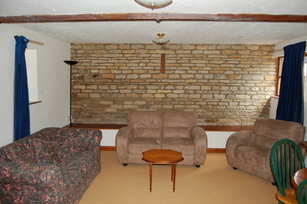 With exposed beams and woodwork, but with refurbished kitchen and shower room, it is ideal for a comfortable get-away. The galleried, mezzanine-level bedroom looks down on the main living area, which in turn is just a short walk across the yard from Wing Hall Farm Shop (open April to October). The Old Butler's Office is popular with couples (due to its size, the Old Butler's Office is suitable only for single or double occupancy and not suited to children), with plentiful pub walks and open countryside on its doorstep. Mountain bikes are available for guests to borrow at no charge from Monday to Friday. Sorry, dogs are not permitted in the Old Butler's Office. Situated in the heart of the village of Wing, The Barns offer real country cottage retreats, with views across valleys and countryside and with easy access to footpaths. With a choice of property, The Barns offer privacy and indpendence, with proximity to the local pub and within five minutes walk of Wing Hall. The fully equipped kitchens contains dishwasher and microwave, plus full oven and cooking utensils. The bathrooms are a good size and offer both a bath and shower. The large, light sitting rooms (No.2, left and No.1, at top of page) have sofas, books to borrow, digital set-top boxes offering a range of tv channels, plus dining tables for family meals, with views across the beautiful Rutland countryside towards Rutland Water. The Barns are in a quiet residential area; we ask that guests consider local residents at all times during their stay, by keeping noise to a minimum and parking in the designated areas. We will require a security deposit to guarantee each booking and are able to take full payment and deposits by cheque, credit card or cash. As each guest has different requirements, please contact us for a personalised quote, or complete an on-line form and we will get back to you with a proposal (we aim to do this within 24 hours).